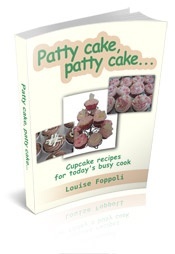 The official "Patty cake, patty cake..." cupcake ebook has gone on sale today. As a much-valued Cupcake Corner subscriber you can expect to enjoy a great introductory price for 2 weeks only... 30% less than a normal web visitor would pay! For just $14.95 you'll be able to grab this 120-page 'easy-print' e-book packed full of over 100 clearly explained cupcake recipes and frosting ideas (some of which are not even on the site). How do you buy it? Just click here to be taken to the full buying and downloading instructions. Lots of readers have submitted recipes and I have included as many as these as possible. Thank you very much to everyone who has contributed. I have been busy making all your recipes and my family love you!!! My friends and neighbours also love taste-testing for me. "Patty cake, patty cake..." is packed full of easy recipes for today's busy cook. "Patty cake, patty cake..." is a great place to start.